E-mail written 2003 to Lew Griffin from Frederick N. Gleaton, e-mail address. John Elbert Culpepper, 1863 - 1893. Gladys Barry, Daughter, F, Jul 1899, 10/12, Sng, GA/GA/GA. 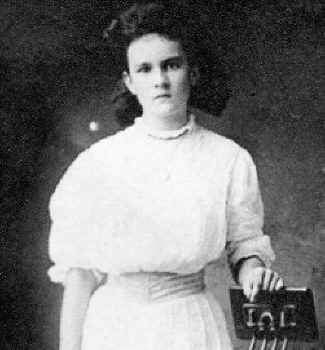 Lydia Williams Barry, Oct 17, 1870 - Jan 7, 1949. E-mail written 2001 to Lew Griffin from Nancy Gleaton, e-mail address. Mary Lou L. McDonald and Samuel Jordan Lawson III, compiler, The Passing of the Pines: A History of Wilcox County, Georgia, Volumes I & II, Roswell, GA: WH Wolfe Associates, 1984, 1987. Royce E. Culpepper, d. 27 Feb 1979 at 62 years in Crisp Co., GA; Res. in Crisp Co., GA, 004290. Charlie D. Culpepper and Hezzie Holmes on 30 Dec 1922 in Pulaski Co., GA. Infant of C. D. Culpepper, d. 30 Dec 1938 in Bibb Co., GA.
William Joel Culpepper and Catherine Alice Brown on 6 Sep 1947 in Bibb Co., GA, Book W-156. Lucile Culpepper, Wife, F, 16, md, GA/GA/GA. Ida Mae Culpepper and Lonnie Barlow on 12 Mar 1922 in Pulaski Co., GA.
Morris Culpepper and Thelma Davis married in 1940 in Seminole Co., FL. Morris P Culpepper, White, Married, born 1915 in Georgia, residing in Volusia Co., Florida, enlisted as a Private in the US Army on 4 Jan 1943 in Camp Blanding, Florida. Find A Grave Memorial# 43325235. Obituary of Mrs. Grace J. Culpepper, published 2 Oct 1997. Obituary* 11 May 2004� CORDELE — Audrey Culpepper, 83, of Cordele died Sunday, May 9, 2004, at Crisp Regional Nursing & Rehab Center. The funeral will be at 2 p.m. Wednesday in the chapel of Hughes & Wright Funeral Home with interment in Sunnyside Cemetery. Mrs. Culpepper was a native of Pulaski County. She was a retired shoe department sales lady for Roobin's department store. She was a member of Cordele First Baptist Church and TOPS. She was the daughter of the late William Chadwell Culpepper and the late Mamie Hill Culpepper. E-mail written 2005-2009 to Warren Culpepper from Cynthia I. Nason, e-mail address. Mamie H. Culpepper, d. 17 Jun 1958 at 72 years in Crisp Co., GA; Res. in Crisp Co., GA. The Albany Herald, Albany (Dougherty Co.), GA.
Obituary for Audrey Culpepper, 11 May 2004. Tad Evans, compiler, Pulaski County, GA Newspaper Clippings, Volume IV 1888 - 1897, Savannah, Georgia: Tad Evans, December 2000.
p. 127, Thursday, November 7, 1889. Joseph Culpepper, Brother, M, Mar 1889, 11, Sng, GA/GA/GA. Charlie A. Culpepper, Son, M, 23, Sng, GA/NC/GA, Farmer. Mildred Booker, Niece, F, 22, M, md @ 20, GA/GA/GA. Lee County Historical Society, Lee County, Georgia, A History, Atlanta, Georgia: WH Wolfe Associates, 1983, Repository: LDS Family History Library - Salt Lake City, Call No. 975.8943 H2L. Cordele Dispatch, Cordele, GA; http://www.cordeledispatch.com. Obituary of John O. "Cotton" Culpepper (#3671), published 18 Dec 2008. Mrs. Eunice A. Culpepper, d. 13 Feb 1927 in Crisp Co., GA.
Mrs. Anna V. Culpepper, d. 19 Sep 1932 in Crisp Co., GA, 21339. John O. Culpepper, d. 16 Jun 1943 at 59 years in Crisp Co., GA.
Obituary of William Quincy Culpepper, published 4 Sep 2007 in the Atlanta Constitution. Obituary* 16 Mar 2014� Spartanburg, SC. Laura Anthony Starr Culpepper, born March 12, 1924, passed away in Spartanburg, South Carolina on Thursday, March 13, 2014. She was the daughter of Frank and Ruth Starr, of Cordele, Georgia. She was the cherished and loving wife of the late Quincy Culpepper for 59 years. They made their home in Atlanta, Georgia where they raised their three children. Ann graduated from Georgia Women's College in 1946. Ann and Quincy were members of Oak Grove United Methodist Church where Ann volunteered with many charitable activities such as Meals on Wheels and also playing piano in Sunday School. Ann was a devoted daughter, wife, and mother of three children, who hold close the memory of her. Ann's children and their families are: Carol and John Reeves, John Emory, III; Andrea, Thomas, Abigail, and Vivian Vandervort; Marcia Culpepper Lynch, Anna Quinn Lynch; Agatha, Jamie, and Annabelle Rule; Mike, Susan, and Will Culpepper; Jessica, John, and Audrey Graham. She shared her love to not only her friends and family but to total strangers that crossed her path. She taught us graciousness, patience, care, and unconditional love. As she journeys on, we will let go, yet keep her forever in our souls. Memorial contributions may be made to Oak Grove United Methodist Church, 1722 Oak Grove Road, Decatur, GA 30033; or Amedisys Hospice, 818 East Main Street, Spartanburg, SC 29302. We thank her Dillon Pointe family, especially Jaimie Seay and her dear sitters, Teresa Bishop and Maxine Sullivan who looked over her and loved her. Obituary of Laura Anthony Starr Culpepper, Published 16 Mar 2014 in The Atlanta Journal-Constitution. H. P. Culpepper, Boarder, M, Wh, 23, sng, GA/GA/GA, Miner, Coal Mine, Vet=No. Ernest C. Culpepper, d. 10 Sep 1981 at 71 years in Crisp Co., GA; Res. in Crisp Co., GA.
Ben H. Culpepper, d. 3 May 1982 at 67 years in Fulton Co., GA; Res. in Clayton Co., GA, 015841. E-mail written 6 Oct 2010 to Warren Culpepper from Katherine Elizabeth Culpepper Zeanah (#61788), e-mail address. David Sneads Culpepper Family Bible, in the possession (2000) of Perry Melton Culpepper, http://gen.culpepper.com/archives/ga/misc/dooly-bible-davidsneads.htm "Geo. C. Larrsey and Mary S. Culpepper was married 22 Dec 1889".